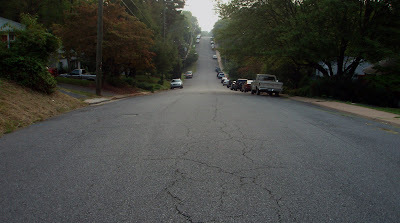 This is a residential street in my neighborhood that I travel along during my morning run. When I arrived here this morning, I actually took out a tape measure and measured the width of the street at 38' across! If I were in a car, I don't know if I could resist the urge to slam on the gas and fly down this straight and gently sloped mass of pavement. I bet you could even get some air when you hit the hill. I should mention that there is both a park and a middle school on the other side of this hill. Instead of writing my own snide remark, I thought I would just punt to James Kunstler's Geography of Nowhere. "Highway engineers have developed a standard perfect modern suburban street. It is at least 36 feet wide - the same as a county highway - with generous turning radii. This makes it easy to drive well in excess of thirty miles an hour, a speed at which fatal accidents begin to happen. A perfect modern suburban street has no trees planted along the edge that might pose a hazard to the motorist incapable of keeping his Buick with in the thirty-six-foot-wide street. The street does not terminate at any fixed objective that would be pleasant to look at or offer a visual sense of destination - no statues, fountains, or groves of trees. Such decorative focal points might invite automotive catastrophe, not to mention the inconvenience of driving around them. With no trees arching over the excessively wide streets, and no focal points to direct the eye, and cars whizzing by at potentially lethal speeds, the modern suburban street is a bleak, inhospitable, and hazardous environment for the pedestrian." Amen. Thank God for traffic engineers like Walter Kulash, eh?